February 8 marked three months since the deadly Camp Fire. Survivors Paul and Suzie Ernest are two of three patients still recovering at the UC Davis Burn Center. SACRAMENTO, Calif. — Friday, Feb. 8 marked three months since the Camp Fire, California's largest wildfire. Survivors Paul and Suzie Ernest are two of the three patients still recovering at the UC Davis Burn Center. Paul remains in critical condition, but his wife Suzie is in good condition. Both still have months, if not years, of recovery ahead of them. "We've been told it's a marathon not a sprint, and it's proving to be every bit as much," their son Jessee Ernest said from his home in Chico. "It has far exceeded the time we thought mom and dad would be away from us." 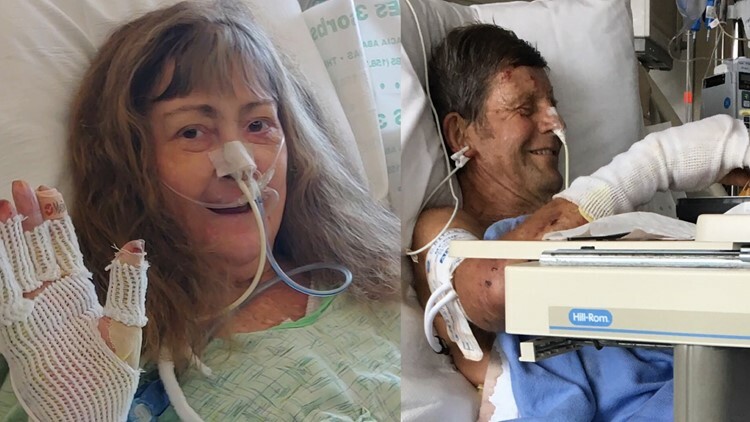 Paul, 71, and Suzie, 67, almost didn't survive the Camp Fire — which killed 85 people last November. As flames engulfed their Paradise home, they had nowhere to go but behind a large boulder. Waves of fire flowed over them. "My mom's shoes burned off," Jessee recalled. "My dad's shoes...cooked." Miraculously, first responders were able to rescue the couple. They were airlifted to UC Davis medical center, alive, but with serious burns. Paul and Suzie are two of 12 Camp Fire survivors treated at the UC Davis burn center. Only three remain in the hospital. "Once they spent a little time in the hospital my dad kind of took a down turn. He's been suffering from a little bit of delirium, which is pretty common in the ICU," Jessee said. "And they both have had numerous surgeries while they've been in there." Jessee and his siblings each try to visit their parents at least once a week. Other family and family friends do as well. "We bring him music. He loves his rock and roll. We bring him some Rolling Stone, Jimmy Hendrix," Jessee said of his dad, who is unable to talk due to a tube in his throat that helps him breathe. "My mom, we get to play cards. We might get something to eat with her. We get to talk to her." Jessee is ready for the day his mom and dad will finally be able to come home. But since their house didn't make it, even that is an added challenge. On top of that, he says Medicare coverage ends after 90 days, which now leaves them in an uncertain position when it comes to paying bills. "Until they get out of the hospital and we figure out all the costs they've accrued, it will be hard to know how their lifestyle is going to be changed, despite physically," he said. When Paul and Suzie do eventually settle somewhere new, Jesse has saved seeds from the two surviving tomatoes from their garden. Something from their old life, to help them start over. "Whenever my parents are ready to do something with them," Jessee said, "I hope they replant them and have a nice story to tell. At least once nice story to tell from all of this." Clik HERE for a GoFundMe set up the help the family. How would you escape the massive Camp Fire in Paradise, California? When the Camp Fire ignited, it started a chain of events that allowed it to become the deadliest wildfire in California history. There was no plan to handle an evacuation on this scale, and it lead to more than 80 deaths.